One of the factors that is attractive for me in deciding to read a book is location. If a book takes place in an “exotic” location I’d like to visit, or if it is set in a place I’ve either lived in or visited before, I am more likely to read it. When I learned that A Small Fortune was set in both Mexico and Switzerland, I actually decided to read it because of the setting rather than the plot — although this is a completely plot-driven novel. Celia Donnelly is an over-worked copy editor from Portland, Oregon, whose life isn’t all that extraordinary. She appears to be only lukewarm in her marriage to her husband of eighteen years, and has a somewhat strained relationship with her sixteen-year-old son. So when her husband decides to surprise them with a spring break vacation to Mexico, Celia jumps at the opportunity. But the vacation does not end up being the vacation of Celia’s dreams. Less than 24 hours after their arrival, Celia is kidnapped and locked in a room for reasons she does not understand, yet her kidnappers seem to know everything about her. As the story unfolds, she begins to learn that her life and her history are not at all as she had thought. I don’t want to give away too many details of this fast-paced thriller, because I don’t want to spoil the story for any potential readers. I will say that this was an enjoyable page turner. I don’t generally read a lot of mystery-type books, because I often find them too predictable, but that was definitely not the case with this book. It is full of drama and surprises. Sometimes the drama is a little too high, and the storyline is a bit unbelievable, but that didn’t really take away from my enjoyment of the book. I don’t always expect books to be 100 percent realistic. I was a bit bothered a few times that the story jumped ahead without filling in all of the pieces in the protagonist’s chronology, but I imagine author Audrey Braun did this intentionally so as not to bog the story down too much. 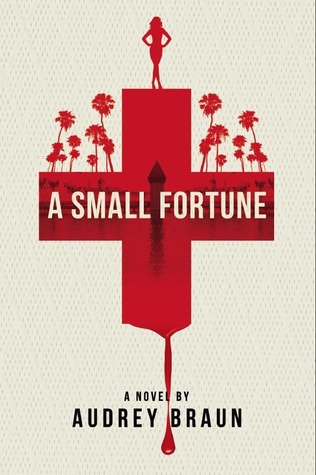 If you are looking for a quick, easy read with lots of action and a little bit of romance, then A Small Fortune is an entertaining possibility. This entry was posted in Around the World Virtual Book Club. Bookmark the permalink.